Human sweat is composed of amino acids and is, therefore, of a slightly acidic nature. This can be a real problem in fine mechanics. The effects of human hand sweat on polished metal surfaces is similar to the etching process. This is why Ballistol is widely used in the precision gauge and tool industry and in the production of scales or other precision instruments. For the same reason Ballistol is used in quality control departments of manufacturing companies and in laboratories for the protection and maintenance of precision gauges and measuring tools. Ballistol forms a protective film on the surface of metals. Due to its low superficial tension it is capable of creeping into the finest cracks and fissures in metallic surfaces. This also makes Ballistol an excellent “penetrant”, loosening frozen nuts and bolts. 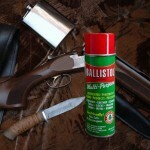 Of course, Ballistol can do whatever other lubricants/protectants can do. Use it on tight or squeaky hinges, on door locks, padlocks, for the maintenance of gardening tools, lawn mowers, scissors, pocket knives, as sharpening oil, on bicycles, motorcycles, your model train, roller blades, skateboards, ski bindings and edges, etc., etc. But Ballistol does more. It can be used to polish silver and brass. And it will even protect WET surfaces. 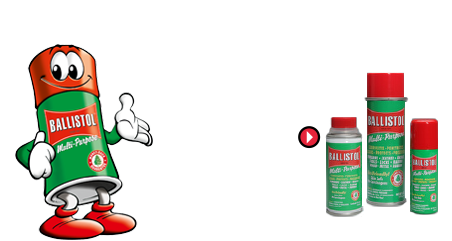 Unlike most other lubricants Ballistol emulsifies with water. Water will separate the leading brand from metal.  Ballistol mixes with the water and penetrates it. When the water evaporates, Ballistol stays behind and continues to protect the metal-or plastic or wood.